F. Silverman Announces Relocation to Tice’s Corner this June! It’s official — F. Silverman Jewelers is moving this June! The move marks a significant milestone in our company’s long history. The new store is conveniently located at 431A Chestnut Ridge Road in Woodcliff Lake, New Jersey, a short three miles down the road from our original location. 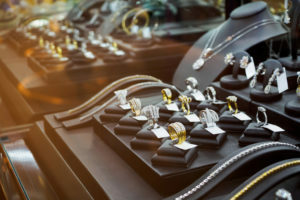 “The new store is bigger, better, more beautiful, and accommodates more inventory, giving our customers even more choices in fine jewelry than they have in our current location,” says store owner Stewart Krell. The new-and-improved showroom is located in Tice’s Corner, a retail center with 22 distinctive stores. Tice’s Corner offers a unique blend of fashions, home furnishings, technology, and food. Their wide variety of specialty retailers includes Madewell, a chain featuring stylish apparel for women, including denim, shoes & bags; and Francesca’s, a boutique offering an eclectic mix of carefully-curated clothing, bright baubles, bold accessories, and playful gifts. F. Silverman is located right between the two stores, so we’re in good company. Other notable brands in Tice’s Corner include Anthropologie, Pottery Barn, J.Crew, Williams-Sonoma, and Apple. F. Silverman’s new store hours will be 10 a.m. until 7 p.m., Monday through Saturday. Please visit us in the new space and take advantage of our always extraordinary prices on exceptional jewelry. Woodcliff Lake is just a stone’s throw away from our current Montvale store. It is also the name of the reservoir that lies primarily within the Bergen County borough, with a small portion at the southeastern edge located in neighboring Hillsdale. The town, with a population of roughly 6,000 has seen intense development over the past 50 years, as virtually all areas available for construction are now developed. Yet this New Jersey community still exudes small-town charm and hospitality. For more than 20 years, F. Silverman has served the residents of Bergen County, NJ, providing a fabulous array of diamonds, jewelry, and gift items from which to choose. Our collection includes exquisite pieces from some of the finest jewelry designers in the world. Our reputation for extraordinary customer service precedes us in our move to the new location, and we look forward to serving the patrons of Woodcliff Lake, NJ and the surrounding area, as well as our loyal customers from nearby Montvale, NJ just down the street. As before, our on-premises jeweler will cater to your specific repair needs or customize an original piece to your specifications. Our motto is straightforward: “Fine Jewelry, Surprisingly Affordable.” We invite you to get to know what thousands of customers already know – that your experience with F. Silverman will be as memorable as your purchase.